What Kind of Vacuum Do I Need for Shag Carpet? Shag carpets were popular in the 1960s and 1970s when texture in living spaces and offices was the fad. These carpets are comfortable and help muffle noise, which makes them ideal for multiple-family residences and spaces with a lot of foot traffic. However, the shag carpet's high pile collects more dust and requires regular vacuuming and maintenance to keep it clean. For that reason, it's best to invest in a vacuum with a dedicated high-pile setting. Shag carpet is defined as any carpet or rug with a high or deep pile. The pile is the part of the carpet that sticks up from the surface of the floor, creating the texture of the rug. A shag carpet is soft on the feet and creates a kind of a cushion on the floor. Shag carpeting can be a single, simple area rug or a wall-to-wall affair. Shag carpeting can come in a variety of materials, colors and thicknesses. The definitive trait of all shag rugs is the deep pile. Traditional woven rugs like a Persian rug or a rag rug have a very low pile. Some floor coverings like the standard welcome mat have a thick, high pile made of dense, coarse material. While these aren't rugs per se, they're constructed with the same principles as shag rugs, with the coarse pile acting as bristles for the bottoms of shoes. Shag carpets are glamorous and fun carpets to own, but they do require more upkeep than a traditional rug. They can also be more expensive. The cost plus the maintenance can be a deterring factor for those who don't want to invest a ton of time and energy into cleaning something as regularly as a high-pile carpet needs to be cleaned. What is the History of the Shag Carpet? For many people, the aesthetics of shag rugs and shag carpeting are most associated with the 1960s and 1970s. However, the fact is that shag rugs were popular as far back as Ancient Greece. In 331 B.C., shag rugs – then called Flokati rugs – were popular in Turkey and the central regions of Asia. Flokati rugs were designed with a dual purpose, both to keep feet warm and be comfortable enough for sitting on throughout an evening. Early Flokati rugs were woven by hand and made of goat hair. Nowadays, shag carpet is made out of many different types of fibers, but the key is that it has a deep pile. It's this quality – more than fiber, color or pattern – that defines the style. During the 1960s and 1970s, shag carpeting experienced a resurgence in popularity, with movie stars lining their homes with the fabric. The trend gave way in the 1980s to a refined and luxurious low-pile carpet with a minimalist sensibility. However, in the 2010s, a more modest version of the shag became popular again. What Are the Pros and Cons of Shag Carpet? The positives of shag carpeting are numerous if you're someone who likes a bold design choice. A shag rug is its own decoration and allows the rest of the room to be more modest in its design in order to give the rug its front-and-center focus. However, there are negatives to owning a shag carpet as well, and homeowners must decide what's most important to them. Aside from the very obvious visual appeal that shag carpeting lends to a room, this style of carpet also makes a space comfortable. Sitting on a shag carpet is far more comfortable than sitting on a low-pile one, and for homeowners with limited seating space, this can be a boon. The main cons of shag carpeting are related to cleanliness and maintenance. This is why the proper vacuum for shag carpets is key. Staining is an issue for shag carpets because the long fibers make it that much harder to clean. The long fibers of shag rugs also trap dust and dirt more easily than low-pile carpets and have a tendency to stay dirtier longer. In addition, shag carpets also have a tendency to shed. This can mean finding pieces of the rug fibers strewn across the room, which can make a house look messier than it ought to. What is the Best Vacuum for High-Pile Carpet? The best vacuum for shag carpet is also the best vacuum for any high-pile carpet. Long- or high-pile carpets can create many difficulties for owners who are hoping to keep a clean house. And the issues with vacuums are many, as not all vacuums are created equal. A vacuum that has very powerful suction will get sucked down to the base of the carpet where it can't clean the fibers as well. It also poses the risk of pulling too hard on the shag and tearing it. However, on the other side of the coin, a vacuum with weak suction will do nothing to get to the base of the rug where the lions share of dust and debris live. The critical factors of a shag rug vacuum are the weight of the vacuum and the degree of suction. A heavy vacuum will be very difficult to move over a high-pile carpet, and it's very likely that the vacuum's wheels may get stuck in the fibers of the carpet and make it difficult to maneuver. A heavy vacuum will also generally have a head that's very difficult to wield, making it tough to direct it in the necessary back and forth motion. A lightweight vacuum with medium suction and a soft brush is a great choice. While many shag carpet reviews will tell you that they're not the easiest things to clean, it can be done and it's worth doing. 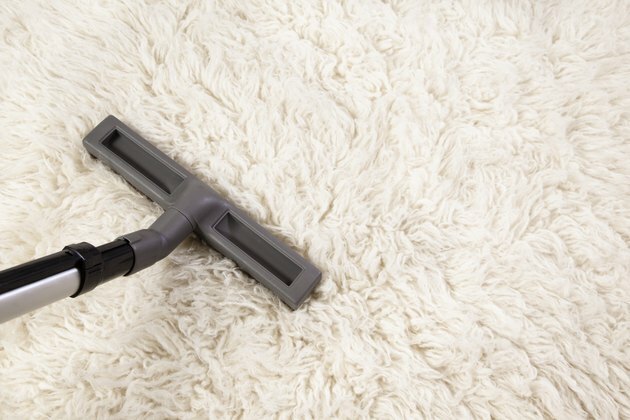 Proper care and vacuuming of your shag or high-pile carpet will ensure that it will look great for years to come. The first thing you want to do is pick up any debris that's too big for a vacuum. Often, small objects, coins or other items can become lodged in the shag pile and go unnoticed until they clog or break the vacuum. After clearing any large items from the carpet, it's a good idea to shake out the carpet outside, getting anything loose off of the surface. If you have wall-to-wall shag carpeting or a very large rug, this may not be an option. However, if you have an area rug that's small enough to be rolled up and taken outside, it's a recommended step. After you've done these two preparatory steps, you're ready to vacuum. Plug in the vacuum and turn it on, making sure it's on a medium suction setting. Move the vacuum's head over the carpet in every direction. This will help to ensure that you get bits of dust and dirt that otherwise wouldn't have been captured because they were buried beneath the pile of the carpet. If you're used to raking your rug every week or so, it is likely that you don't have a ton of leftover debris. However, it is still a good idea to give a shag rug a good shake from time to time. If you are able to do it yourself, take the rug outside and shake it out. You will likely be surprised by how much dust and dirt and debris is released. If your rug is large it may be helpful to have a friend or partner hold the other end of the rug for you so you can both shake it together. Experts say that shag rugs need to be deep cleaned at least 3 or 4 times a year. Not doing that means you risk building up dirt and bacteria that can damage your carpet and your health. This is particularly a concern for families with pets or small children who may find dirt caked into the shag rug and put into their mouths. Also, shag rugs can start to get an odor after tons of foot traffic, spills and environmental elements. If your shag rug has no rubber on the back and is not a wall-to-wall carpet, it is likely that you can feel free to toss it into the washing machine. Wash it on low in the gentle cycle with very cold water. Once you have finished, you can let the rug air dry overnight. Make sure it is in a place where it will get plenty of ventilation and can get completely dry before you put it back on the floor. This will help prevent mold and other issues. Once you've shampooed the rug you need to be sure that you are sucking up all of the associated moisture. This is critical, particularly if your shag rug has a deep pile. Leaving moisture or shampoo on a shag rug is a recipe for mold and bacteria, which nobody wants and can pose other health problems. Once you have finished shampooing your rug, make sure you that you allow it to dry. Open doors and windows, and rent a fan if needed. Do not let family members or pets walk on the rug until it is 100% dry. A few times a year you are likely going to drop or spill something onto your shag rug. While this is frustrating and difficult, do not panic. It is likely very treatable. For protein stains, like blood, organic matter, dog waste or sweat, use a peroxide-based cleaner to treat the stain. Spray the cleaner on and allow it to penetrate the stain. Then gently blot with a white cloth, and rinse the affected area with cool water. Do not use hot water on a protein stain, as it will likely set it into the fabric. Stains like ink, red wine and chocolate can be treated with carpet cleaner, carbonated water and some salt. Apply these solvents to the stained area and allow it to penetrate the stain. After a while, blot the stain with a soft cloth and then rinse with a sprinkle of salt and carbonated water. If the stain is not completely removed, you may need to have a professional carpet cleaner treat it. However, if your shag carpet is a dark color like blue or red or gray, you may find that the stain blends in with the color and is not a problem. Ashley Friedman is a freelance writer with experience working in the home, design and interiors space.